The world has innumerable problems such as environmental protection, population problem, energy problem, low birth rate and aging, etc. In order for human society to overcome these problems and sustainably develop, creative innovation is required. Creative innovation is indispensable in order for Japan to continue to maintain its competitiveness in the future. On the other hand, Japan has regions, each with its own characteristics and strengths, and it is considered that creative innovation based on this diversity will result in an increase in the strength of the nation. This is the same as the research target of this university, which is "to open up the frontier of human knowledge, to promote original research aiming for sustainable development of human society based on co-existence with nature, to propagate the results to the regions and to the world, and to create a research environment to bring out young talent". Based on this situation, at Shinshu University an Interdisciplinary Cluster for Cutting Edge Research has been established to solve problems with creating a sustainable society, such as fibers, textiles, water and environment, energy, treatment of difficult diseases, disease prevention, etc. In the Interdisciplinary Clusters for Cutting Edge Research, the education and research areas and sustainable development research areas that need to be continued into the future and that can be undertaken as fusion and collaborative education and research have been selected in accordance with the characteristics of the university. Specifically, the "Institute of Carbon Science and Technology" in the field of carbon which can become basic science for the 21st century and in which the university has conducted world-class education and research to date; the "Center for Energy and Environmental Science" in the environment and energy field which is indispensable for the next generation, in which up-and-coming researchers undertake research as a group with mutual collaboration; the "Institute for Fiber Engineering" in the field of fibers and textiles that continues to develop clothing, which is one of the essentials of life, and the essential raw materials for various industrial fields; the "Institute of Mountain Science" in the field of conservation /prediction of mountain environment and management of resources which is engaged in conservation of the rich natural environment in the Alps, predicting changes in climate or ecosystems, and sustainable management of resources; and the "Institute for Biomedical Sciences" in the fields of treatment of difficult diseases and disease prevention engaged in advanced prevention of conditions and dealing with difficult diseases with the aim of raising the healthy age in response to a highly-aged society. It is considered that by further merging these research areas, sustainable development will be enabled. 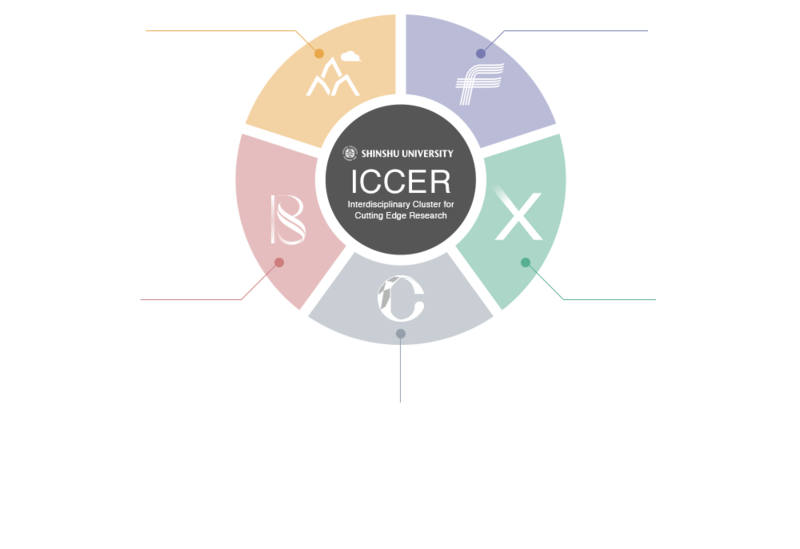 In these research clusters, by developing the environment with an emphasis on research, inviting prominent external researchers, and introducing new human resource development systems to cultivate young researchers into prominent researchers, it is considered that the next generation of outstanding researchers will be nurtured, while maintaining our position as a center of as a center of excellence. To be among the world's top level of research institutes for basic and applied science of carbon. To propose new dimensional solutions for environmental and energy materials research. World-class research continues to innovate textiles.